The Little Yellow Cottages are a handful of cottages located on a quaint, beautiful lot in Downtown Port Austin. With guests coming from near and far, the property provides the perfect getaway for those looking to relax and make memories with the ones they love. From our first experience at the Little Yellow Cottages, it was evident that the owners had worked very hard over the years to give their guests a carefree and comfortable place to stay. As we toured the clean, cozy cottages and the green space surrounding, we came to know that the Little Yellow Cottages had an incredible charm about them. So when the owners approached us about updating their site, we were beyond excited to help! Essentially, there wasn’t anything necessarily “wrong” with the existing site. It just happened to be a bit dated and seemed to be missing the true essence of the cottages. As the owners were looking to achieve a more user-friendly, updated site, we we more than sure we could assist them. What we came up with was a new website that we think utilized that perfect balance between usability and character. Perhaps we are slightly biased because we fell in love with the people, the property and its charm, but we don’t think we can pick just one favorite thing about their new website! Justin snapped some gorgeous photos of the cottages and the property. 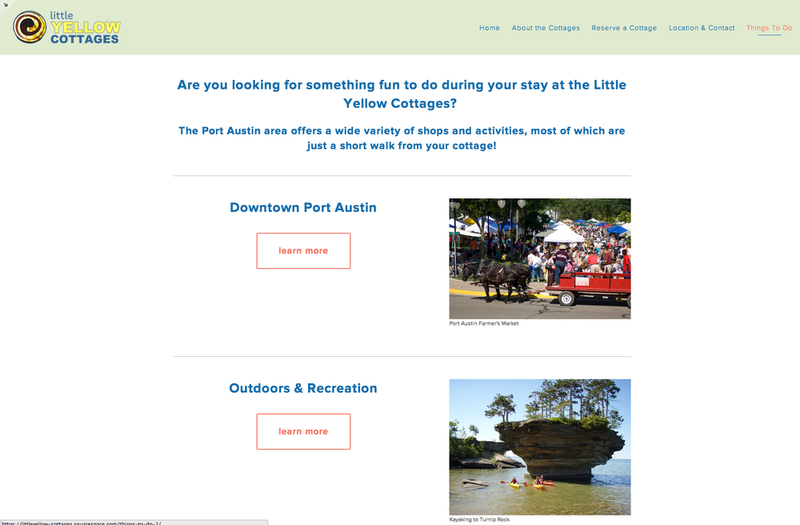 He was able to use them on the site in a way that really captures what the Little Yellow Cottages are and why guests enjoy their visit to this quaint place. Justin also was able to give the new website a facelift with fresh new colors and design. As far as usability, we were able to utilize buttons to help take guests more easily through the different cottages and their features. It may be that one of the most beneficial features that was added to the new website was the reservation system. For the first time, the Little Yellow Cottages can be booked and paid for online, helping to streamline the process. 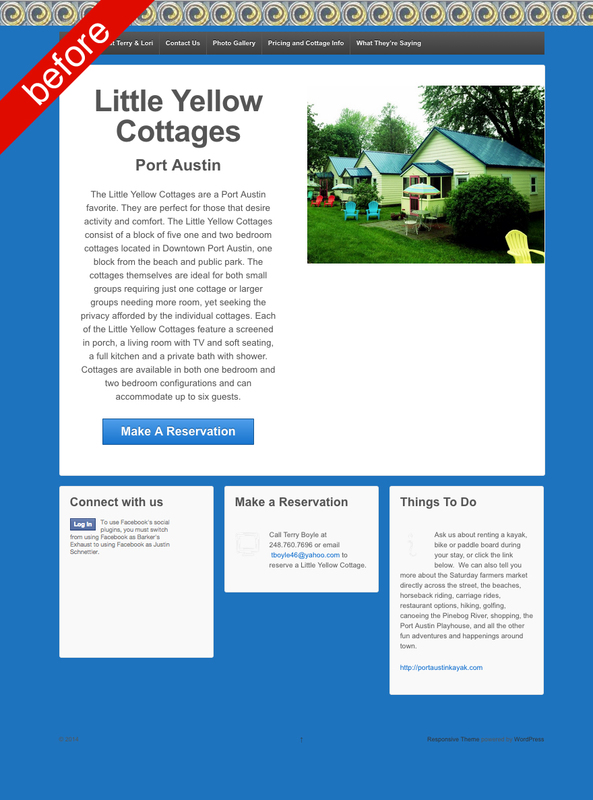 Beyond building a new website for the Little Yellow Cottages and thoroughly enjoying the entire process, we were able to help connect Little Yellow Cottages with the people who may be searching for them online. By claiming certain place pages for their business, we were able to insert information and details to better help their guests get to know them and find them! Overall, the Little Yellow Cottages project has been an absolute joy, and we are extremely pleased with the final product. Do you have a website that needs updating or help getting connected with your prospective customers? We would love to help, don’t hesitate to contact us.